To create great brand positioning, you must do your homework. In a brand positioning project, this homework mostly consists of doing some research about the brand ahead of time. But how do you organize your research? In this post, I’ll teach you a simple tip I learned from Dr. Kevin Keller that will help you frame your positioning research in a way that will ensure you find the answers you need. Why are the answers to these four questions so important? Great brand positioning has one foot in the present and one foot in the future. The research we’re doing to answer these questions helps us understand exactly where each foot should be planted. By studying what your brand community members currently believe the brand stands for and what they value about it today, you’ll begin to understand their current experience of the brand. Yet your community’s experience of the brand can be very different than how you see or talk about the brand inside the organization. So the brand research should study the brand from both an internal and external perspective. Often organizations will notice gaps or inconsistencies between the brand they claim to be and the brand their community sees or experiences—the brand promise-brand experience gap. Once you deeply understand what your community currently believes or values about the brand and compare this to what you currently claim about the brand, you’ll have a complete picture of where your “foot in the present” is planted. You’ll see clearly how big the gap is between your brand promise and brand experience. Only then can you begin the work of building brand positioning that closely aligns the brand promise claimed with the brand experience delivered. But a brand that is only concerned with the present state of affairs is a brand in stagnation. You’ll want your brand to grow, prosper, and remain relevant down the road. So you should also try to understand what the brand community might believe or value about the brand in the future. What directions might people give you permission to take the brand? Where do they not want you to take it? What would they value in the brand that you don’t provide today? What does the organization do today that people would rather not see you continue to do down the road? Sure, to remain relevant you should deeply understand what the community members want the brand to become, but do not become a slave to their vision. You might have entirely different and amazing places you’d like to take the brand that your customers or other community members can’t yet see. So, in order to understand where your foot in the future is planted, you should seek to understand both what your community would believe or value in the brand and what you want the brand to become down the road. Great positioning lives where all four answers intersect. It is a bridge between your current brand experience and the brand you’d like to become in the future. It deeply reflects the brand you currently see while lighting the path to what it could become. 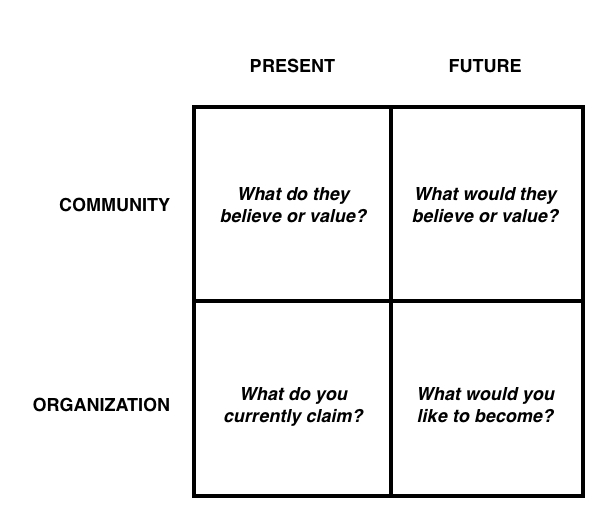 Great positioning lives in all four of these quadrants at once. It can be like the North Star, guiding the organization toward the future, while paying homage to the past and making clear connections between things that resonate about the brand with both your organization and your brand community. So where should you look for data that will help you answer these four questions and start on the road to great brand positioning? I’ll share some of the mostly likely sources of data in a followup post. This is the third in a series of posts drawn from the current draft of my new book The Ad-Free Brand, which will be released in August 2011 and is available for pre-sale now on Amazon.